Editor: When will the signs stating “Wildlife crossings — reduce speed” be put up in high mortality zones? Photo credit: Patricia Tallman. 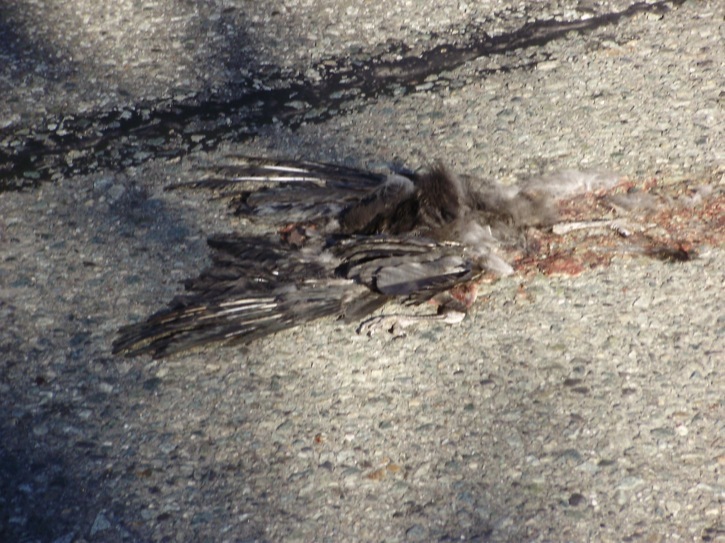 A crow was killed by a car on 208 Street over the long weekend — the latest in a long string of wildlife fatalities on the busy Willoughby street. One such street, 208 Street between 86 and 70 Avenues, has been identified as an arterial road, with over half of observed road kill so far. Over the long weekend, two more victims were hit by cars within half a block of each other on 208 Street, this time at 84 Avenue. The fatalities occurred on the southbound lane, right outside the sold acreage of mixed habitat, just south of the 208 Street overpass. This is the last remaining undeveloped land on 208 Street in the Yorkson area. I urge each councillor, the mayor and planning director Ramin Seifi to drive by this block to see how crucial it will be that the excavation protocol be implemented when this property gets developed. The protocol would compel contractors to delineate the excavation direction, specifically away from busy streets such as 208 Street. One can easily imagine the increase in wildlife fatalities at this location as development progresses. The second reason for these fatalities is driving behaviour. As I noted in my road kill report to Langley Township council back in September 2011, posting signs will help draw motorists’ attention in high-occurrence zones. This is one location that a sign on both sides of the road is warranted. Motorists travelling southbound on 208 Street overpass gain speed and momentum at the bottom of the overpass, which is right where the undeveloped mixed habitat land is located, on the west side of 208 Street. This is where the two victims were killed. There is a maximum speed limit sign of 50 km/hr at the north end of the overpass, for the southbound lane. This is just before going uphill, and motorists need to accelerate. I believe a better placement for this sign would be at the south end of the overpass (the road kill location), where speeds tend to increase. 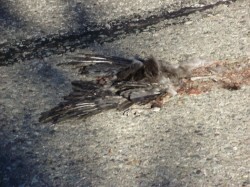 The road kill report was presented in September 2011. Why is it taking so long to decide to put wildlife crossing signs up? What does it take to install some signs to warn motorists of potential wildlife crossings on 208 Street? The first victim at the start of the long weekend was a rabbit. The trail of dried blood was visible for days. The second victim is a crow. How fast would the motorist have to be travelling so that hitting the crow could not be avoided? It appears that more time and energy is spent on not having to do anything, by giving unsubstantiated reasons. Let’s put some simple measures in place to mitigate human-wildlife road fatalities. All life is precious, especially to those individuals who have lost theirs — and in such a violent manner upon impact from motor vehicles.